In this latest epic, two-stage, multi-party boss battle featuring Dark Falz, players will first have to take on "Falz Arms". Players of any level, and in any difficulty, can participate in this ship-wide emergency quest to weaken Falz and unlock his second stage. However, the ship will only have 30 minutes to inflict the required amount of damage. The amount of damage required will be based on ship population when the quest becomes available and players will see announcements updating them on the ship's progress. Once the required damage has been dealt, the second phase (a seperate emergency quest) of the battle will be accessible. 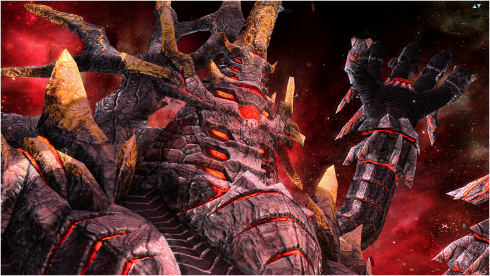 In the second phase, players will battle the boss' true form, Dark Falz Elder, formerly sealed away on the planet Naberius. This form has many arms and will be a challenge to defeat. 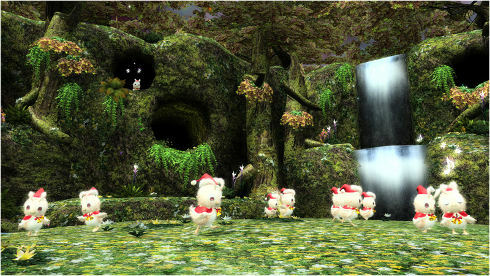 Players must clear the first stage at least once to participate in the second stage. This update will also include the new Pyroxene Shop, which will allow players to trade in rare stones (Rainbow Iritista) for ?10 weapons and other items. It has been confirmed that these stones can be acquired by defeating Dark Falz in the new emergency quests. See the above forum thread for more detailed patch notes, pics and discussion! The maintenance window is scheduled for 9:00PM EST to 3:00AM EST tonight (8pm-2am CST, 7pm-1am MST, 6pm-12am PST). While you're waiting for the game to update, be sure to stop by the PSO2 forums for the latest Phantasy Star Online 2 discussions! Yesterday's massive content update brought with it some unintended bugs that have been causing players to change colors, freeze at loading screens, and shake uncontrollably. The team over at SEGA is on top of it, though, announcing this morning that some fixes are on the way and a 6-hour emergency maintenance will be taking place from 8:00am to 2:00pm JST on 12/7/12 (for those of us in the States, that's tonight from 6pm to midnight EST / 5pm-11pm CST / 4pm-10pm MST / 3pm-9pm PST). Additional bug fixes are also being worked on, but will come at a later time (possibly in Tuesday's update). A big thanks to Mike for posting the news in the above forum thread! According to the interview, players will be transported to the darker nest in this new quest, where their mission will be to escape in one piece. There will be no returning to the camp ship, like with other quests. Instead, players must escape and clear the quest or fail and be kidnapped by the darkers. In the event that they clear the quest and escape, darkers will use recorded data to clone the player(s) and these clones will appear in future emergency trials to fight subsequent challengers. These clones will have the same appearance, use the same skills and abilities, and even utilize the same auto-words as the original players. It will be possible for players to encounter clones of themselves and, in these cases, they can receive additional quest rewards, such as photon spheres and a special title for defeating their clone. This quest is supposed to, in a way, serve as a form of PvP, though the clones will obviously be controlled by AI and not real players. This new "escape quest" is scheduled to be implemented on January 9, 2013. Once you've gained favor with Turo and Kuro, they may give you Turo and Kuro mag evolution devices. If we happened to miss anything (which is definitely possible, given the huge amount of text that was translated), this post will be updated with any new details that turn up. There are also a load of additional screenshots from PSO2 Vita and the new Dark Falz battle within the 4gamer interview, so be sure to go check those out! As always, we'd love to hear your comments, so let us know what you think of these new details either in the comments section or our PSO2 forums! The December 5th content update for Phantasy Star Online 2 is now live and available for players to download. Weighing in at a whopping 4.6GB (2.2GB if you pre-patched), the update brings new seasonal content for Christmas and a large number of other updates to the game. 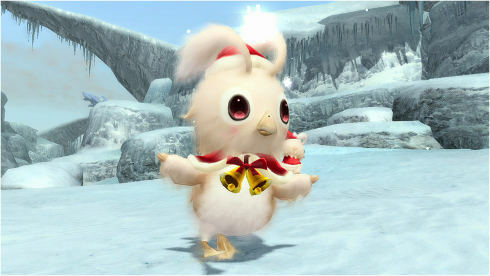 Limited time Christmas emergency quest "Merry Christmas on Ice"
New partner cards for Clotho ?? ?, Joseph ???? ?, Ravelle ???? ?, and Barbara ???? Freeze Tuna (Sword) - ??????? Guwanadaburu (Double Saber) - ??????? Miser Barrett (Twin Machineguns) - ???????? White Rappy Fan (Talis) - ??????????? Time Attack Quests now can be soloed. In addition, SEGA has already acknowledged that there are some unintended side effects of this update, some of which are causing problems for players in-game. We're seeing some reports of these in the forums as well. SEGA is aware of the issues and will be working to correct them as soon as possible. We'll continue to update this post as more information becomes available. Above, you can find a few threads relating to this week's update, straight from the PSOW forums. Don't forget, next week's update brings Dark Falz and the new Pyroxene Shop (details here). As part of the December 5th update and holiday festivities, SEGA has launched a new campaign to reward players who complete the limited-time emergency quest, "Merry Christmas on Ice." While the quest is going to be available until December 26th, the window for participating in this campaign is only one week. In order to qualify for the in-game rewards, players will need to clear the quest before December 12th at 11:00am JST (Dec 11th @ 9pm EST / 8pm CST / 7pm MST / 6pm PST). If you want to make sure you don't miss out, the quest is guaranteed to appear on December 7th, 8th, and 9th at 8:00pm JST (6am EST / 5am CST / 4am MST / 3am PST). Please note that it is not required that you participate during one of these three event times. Good luck! 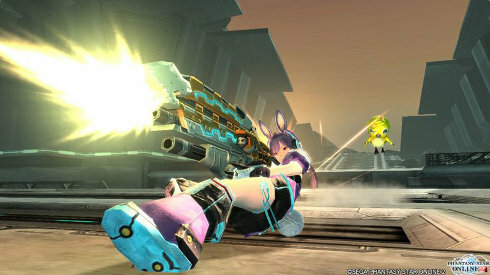 SEGA has officially launched the closed beta signups for PSO2's release on the Playstation Vita in Japan. The signup period will last from today through January 7th, 2013 at 11:59PM JST and 50,000 participants will be chosen (if they receive more applications than that, a lottery will be held to choose testers). You can sign up through the Vita Contents section of the PSN store on either a Playstation Vita or Playstation 3, using a PSN ID that has its region set to Japan (searching for "PSO2" seems to be the easiest way to find the CBT item). Participants who are selected will be notified via email after the application deadline has passed. The pupose of the beta is will be to test general game and server performance, as well as synchronization and interaction with the PC version of the game. This means that players who are selected can also test using a special PC client (will require a SEGA ID). A new ship will be created just for the beta and data from the test will not carry over to the live game. The actual beta period is said to start in mid-January 2013 and exact dates will be announced in a future update from SEGA. A big thanks to Mike for posting the news in our forums, as well as Alenoir and blace for additional information. Be sure to check out the above thread for more discussion and feel free to leave us a comment if you signed up! Good luck everyone! 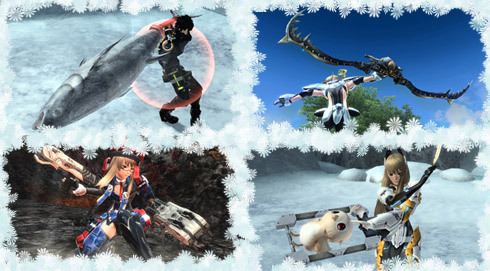 PSO2 (JP) December Updates, New Video, Christmas Event, Dark Falz, and More! The enormous content updates to Phantasy Star Online 2 just keep coming, this time with two major updates being revealed for December. The updates will bring a number of new features to the game and will also have players battling Dark Falz for the first time in PSO2. In addition, Christmas-themed content will be added, including holiday rappies, Santa costumes, lobby decorations and more. Update: The official blog has also been updated with additional information. More details are being added to this article as the news is translated. New weapon potential ability system - Allows unlocking and leveling of hidden abilities on certain weapons through the item shop when grinding to +10, as well as advancement of a weapon's hidden ability using meseta and photon spheres. A weapon which has its hidden ability unlocked will have a gold name and icon, as well as a gold visual effect when equipping it. Parallel Areas - During quests, there will be a possibility of a special transfer device appearing which will move players to one of three random parallel areas. In these areas, rare enemies will be much more likely to spawn. Improved Party Matchmaking - Players will be able to view and choose parties from another block from the quest counter. Doing so will automatically move them to that block. Premium Set Improved - Accept up to 40 client orders (up from 20), improved drink effects, and increased FUN. New ways to obtain grinders and improved chance of acquiring them from FUN scratch. Players will get a chance to battle "Falz Arms" in a new emergency quest. This is a ship-wide cooperative event that must be completed a set number of times within 30 minutes to unlock the second phase of the boss battle. The number of emergency missions completed will be announced at set intervals and phase one will be accessible to all Arks, starting at level 1. 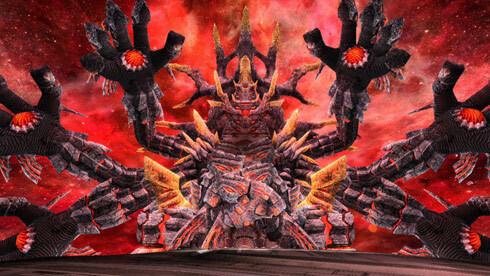 Once the required number of Falz Arms have been defeated, players can continue on to phase two and face Dark Falz Elder (his true form, which was sealed on the planet Naberius). Dark Falz Elder is extremely large with many arms and will be a challenge to defeat. New Trade Shop - In addition to the Falz boss battles, a new shop will be added where pyroxenes (stones such as Iritista) can be traded for 10-star weapons and items. PSO2 producer Satoshi Sakai also mentioned on the official blog that this climactic update is not the end, noting that another major update will be split between the end of December and early January. The name of the future update roughly translates to something along the lines of "A Future Worse Than Death." A big thanks to EvilMag for posting the news about the video in our forums, as well as mailsonds for posting screenshots and Mike for some supplemental details! Be sure to check the above thread for further information and discussion! The hosts challenge the "strongest enemy"
A special new project to commemorate the broadcast breaking 100,000 viewers. The broadcoast starts at 9pm in Japan, with doors opening at 8:50pm JST. To those of us in the Western hemisphere, this should be around 7:00am EST / 6:00am CST / 5:00am MST / 4:00am PST. To view the broadcast, click here. A big thanks to Mike for posting about the upcoming event in our forums. For more discussion, as well as information on how to watch the live broadcast, be sure to check out his thread above. The previously announced Arkz Museum ATTACK screenshot contest for Phantasy Star Online 2 has concluded and SEGA has posted a gallery of the top entries. The gallery features the top 90 entries from the contest and players who made the cut will receive a Gold Medal of Gratitude room decoration item. There are some really great screenshots features, so be sure to check them out! Thanks to Mike for letting us know about the news in our forums. Hit the comments or the above thread to share your thoughts on the contest winners, and congratulations to everyone who had their entry chosen! PSO2 (JP) will be arriving on the Playstation Vita as a free download on February 28, 2013, according to Siliconera. The game will share the same servers as the PC version, which is currently live in Japan, allowing players to play the same characters from either platform and interact in the same virtual world. According to information in the latest Famitsu magazine (via Shogai PSO, thanks Mike), there will also be a beta test of PSO2 for Vita in January. The bundle will sell for 5,229¥ (about $64) and we'll post more information as it becomes available. UPDATE: The bundle is now available for pre-order and can be purchased here. A big thanks to Keii for posting the news in our PSO2 forums. For more information and discussion, be sure to check out the above thread!